Yahoo! Shutting Down Yahoo! Video? We all know that Yahoo! is down sizing very quickly. They have fired a number of employees and are shutting down a lot of services. MyBlogLog is being scrapped and Del.icio.us was also about to be shut down, when the ensuing furor changed their mind and Yahoo! decided to sell it instead. It looks like Yahoo! Video is also about to get booted as well. The functionality to upload videos to Yahoo! Video has already been removed a couple of days back on 15 December. Instead of the upload functionality, Yahoo! is now offering a download button. Yahoo! Video is scrapping all the user generated contents - that is, the video that users have uploaded. These videos will be deleted on 15 March, 2011. So, Yahoo! is now urging users who want to save their videos to download them before 15 March. To download your videos from Yahoo! Video, go to My Video and click on the Download button under the video. 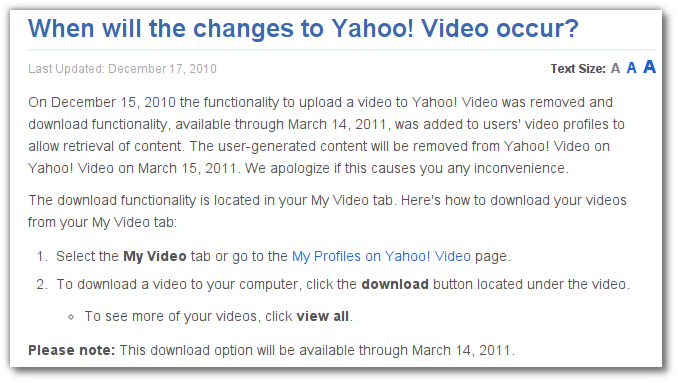 The download button will be available till 14 March 2011 - after which your videos will be deleted. Yahoo! did not exactly say that they they are shutting down Yahoo! Video - only that they are removing user generated contents. But looking at what they have been doing recently, it looks like this is the end of Yahoo! Video as well - why else would they delete videos from a video sharing platform? Feel free to chip in with your thoughts.